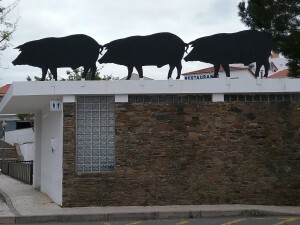 TransPortugal – Day 8 and beyond. 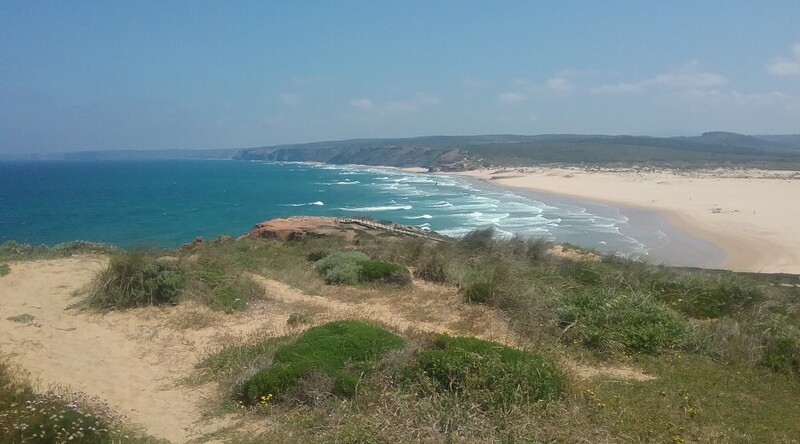 Finally, what looked to be a normal TransPortugal day, sunny, no rain but still a little cool with plenty of wet ground to cover. 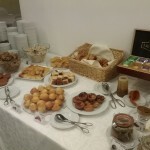 The mood was lighter all around, but particularly amongst the staff. Tiago, the race director, looked as if about a hundred pounds had been lifted from his shoulders. Edgar and Tom with Paulo in the back grinning. The pattern of the last few days held with Tom and Edgar from Mexico lined up at the front of the group, that morning flanked by Sergio (Portuguese) and Guy (Canadian). 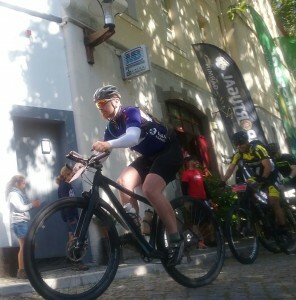 Overall, an easier stage at 95 km but still with plenty of climbing, some it very steep even if the climbs were short. The last stage is interesting in that some riders are totally relaxed as they have nothing left to prove and know that their position in GC is solid, to those that are going hard to try one more time for a better stage finish or to move up that one place in GC. Tom tried to ride hard but didn’t have much left in the legs. He felt better towards the end of the stage and finished strongly. 18th on the day, 12th overall! The last 40 km or so is mostly along high cliffs above the ocean. Some of the most spectacular scenery you can imagine. Then comes the party on the beach. A jump into the sea and the ground finish photo. Plenty of very happy faves faces and beers all around. The morning after is bitter sweet. Riders and staff happy that they get to rest but lots of sadness too. 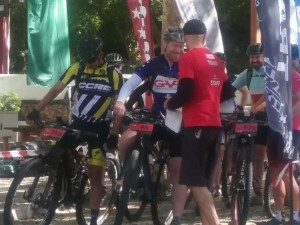 This is such a great event with a small field so you get to know a lot of your fellow competitors and make wonderful new friendships forged in suffering and adversity. Some of these new friends we may never see again. But we have lots of new contacts with invitations to stay from all corners of the globe. We headed back to the Ecork hotel with a stop along the way to surf, then to pick up a left item at the last hotel and I finally got a really good arroz de marisco for lunch. We slept for a very long time in a quiet and very comfortable, giant, fluffy bed. 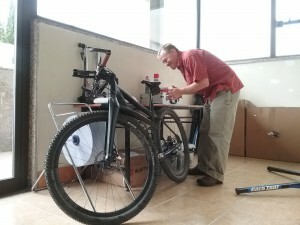 Tom is currently breaking down his bike to go back into his Ritchey case. 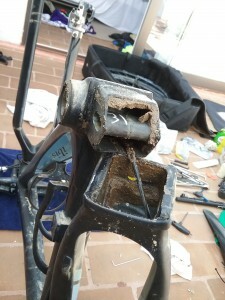 Things that I’m hearing from our lovely shared patio, “ruined”, “rusty”, grinding of parts being disconnected, “never going to be the same”… The bike is destroyed. The frame will be OK but pretty much everything else will need replacing. I just watched him throw a shredded saddle and saddle bag in the trash. Tom explaining to me how very ruined his bike is. 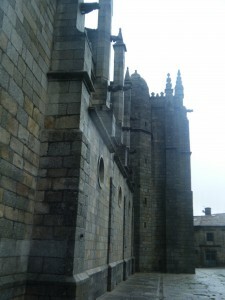 Today is for site seeing in Évora, thank you visits to the bike shops and a long awaited dinner with an old friend. It feels strange to be truly on vacation with a relaxed, loose schedule. Sleep, eat, visit. 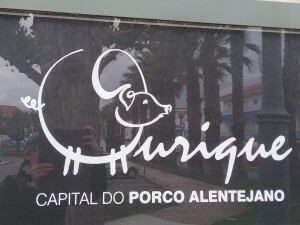 TransPortugal – Day 7, the day the sun appeared. It had been raining for over 1 week. On the morning of stage 7 the Sun finally appeared. 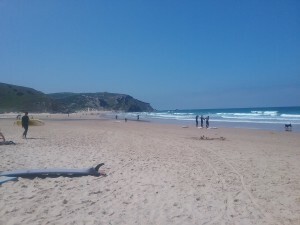 I’m writing this post the morning of Stage 8 and will not be spending much time on this blog post as it’s a beautiful sunny day with 20 degrees Celsius temperatures and an ocean that’s calling to me. 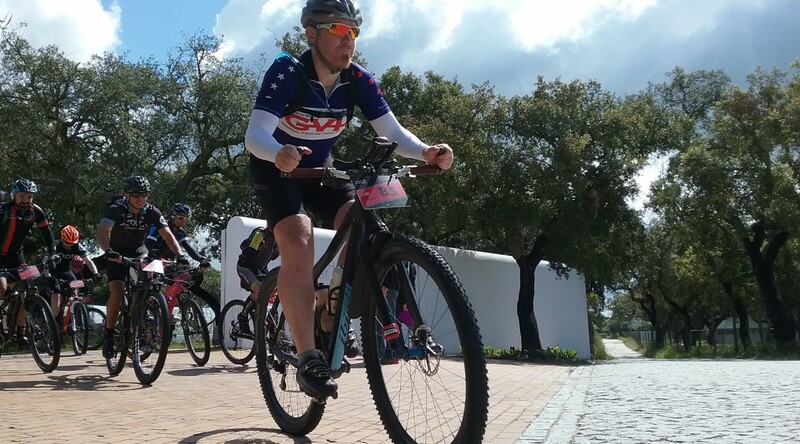 Yesterday was a hard stage at nearly 140 kilometers with a significant amount of climbing towards the end. 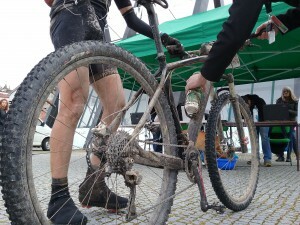 The ground has not dried out so there’s still plenty of mud and the bikes were unrecognizable at finish line. We saw a significant number of mechanical failures again today. There was another case of friends towing another rider when his free hub locked up. Having ridden this stage in 2013 and barely finishing it I can’t imagine pulling somebody else along and making it to the finish line. I’might pretty sure this is Tom’spent bike. My day was full of pigs, pelicans and picking up a rider that did not finish the stage. 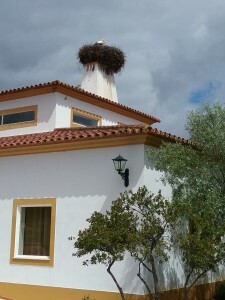 Pelican nest at the hotel. 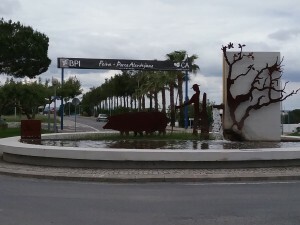 Ourique, the center of pigs territory. 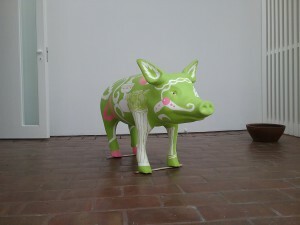 There even pigs on the restrooms. And in the traffic circles. The group’s mood has lightened greatly and there was much rejoicing last night. 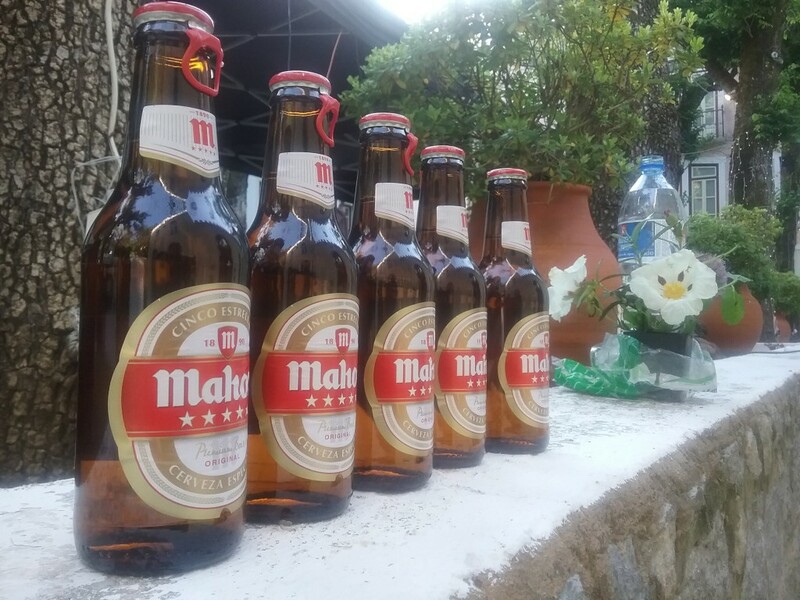 I was surprised to find several unopened beers this morning, alongside the country’s flower. 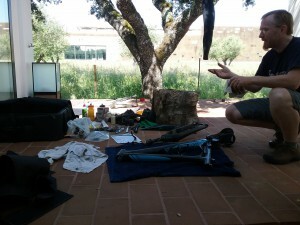 TransPortugal – Day 6, the day the bikes really started falling apart. For the first time since the race began we had sun at the stage start. You could feel the energy of the group come up and the optimism surrounding promise of a rain-free short stage. There were smiles all around and people in short sleeve jerseys for the first time since the race began. Tom worked for the hole shot again and pushed to stay with some stronger riders to hopefully get some help from them on this relatively flat and fast stage. Meanwhile, I had been assigned the task to find some bike parts. Step 1, ask the race mechanics if they had what we needed. The mechanics that have been traveling with the race are exhausted. That morning, I saw them head back to their rooms to sleep at about 6:30 am! By my calculations, they are getting less than 4 hours of sleep per night. I caught Joao a little later and asked but as you all know, Tom has some pretty unique parts and pieces and Joao did not have what we needed. He did recommend a shop in a larger town nearby. I found D’Bike thanks to my handy GPS loaned to me by TransPortugal, and I caught the shop owner just before he left for lunch. Portuguese lunch is sacred and about 2 hours long so I was extremely fortunate to catch him and that he was willing to help me out. He claimed to not speak English (it is really common for Portuguese to apologize for their poor spoken English even though it’s way better than my Portuguese), but we muddled through. He had 3 of the 4 items we needed, but the last item was the hardest to find. So he went a step farther and began calling the other shops. They were all on lunch, so he pulled out his address book and started calling shop owners on their cell phones. He found someone who had a part that could work and arranged for me to meet him at his shop. He even gave me a discount on the items he did have. I tried to get the address for shop 2 (Galacio bike) set up in my GPS, but it wasn’t recognizing the address. So back into D’Bike and Geral helped me again. Finally I get to shop 2. This shop was in a less prestigious neighborhood and was run by someone who obviously just loves bikes. It was jammed full of bikes for repair and had none of the planned retail/marketing feel that so many bike shops have today. When I showed up the shop owner was pumping up a kids tire. More mixed English, Spanish, French and Portugeuse, and I have what I need at a “TransPortugal” discount. Many more obrigadas as I left, and he promptly closed his shop and went back off to lunch. Between the unending help everyone gets from the TransPortugal organization and now the amazing generosity of two complete strangers, my love of the Portugeuse people is stronger than ever. Seriously, come visit this Country, you will fall in love with the people. So now I had to rush to get to Albernoa and having lost so much time in Evora and construction on the way, Tom actually beat me there. 18th on the stage, not quite 4 hours of racing and still 13th on GC. Everyone was covered in mud again, the sun did not last. Tom was in one of the last groups to make it in before the downpour. Groups after him had to contend with sticky heavy mud that jammed their bikes up. I watched John Allison cross the finish line with only one pedal. He said he’d been going along on one leg for about 30 km. Victor Prol and Pablo Rodriguez crossed the finish line with their bikes tied together by a windbreaker. One of these riders had broken his crank and his good friend helped pull him in so that he could finish the stage. I’m starting to feel like a broken record. The stage was long, rainy, muddy and slow. It was quite cold at the beginning of the stage towards the top of the ridge. The leading American, Jane Marshall, found it impossible to maintain her body temperature as she was also struggling with some knee pain that would not allow her to pedal hard enough to get her internal furnace firing. As a result she was unable to finish the stage. This put Tom in the leading American position. While Tom was pushing hard to improve his position in GC, I was running about Castelo de Vida enjoying the sites come exploring the 14th century buildings and ruins. The castle keep is accessible to the public and well worth a visit. It even comes complete with a creepy torture chamber, demonstrating methods used by the Spanish Inquisition. The views from the tower are spectacular. The town by itself is a beautiful example of typical Portuguese Village with narrow cobbled roads, steep hills, white walls and tiled roofs. (Imagine some photos here. Unfortunately, I can’t seem to get the ones I want set up). 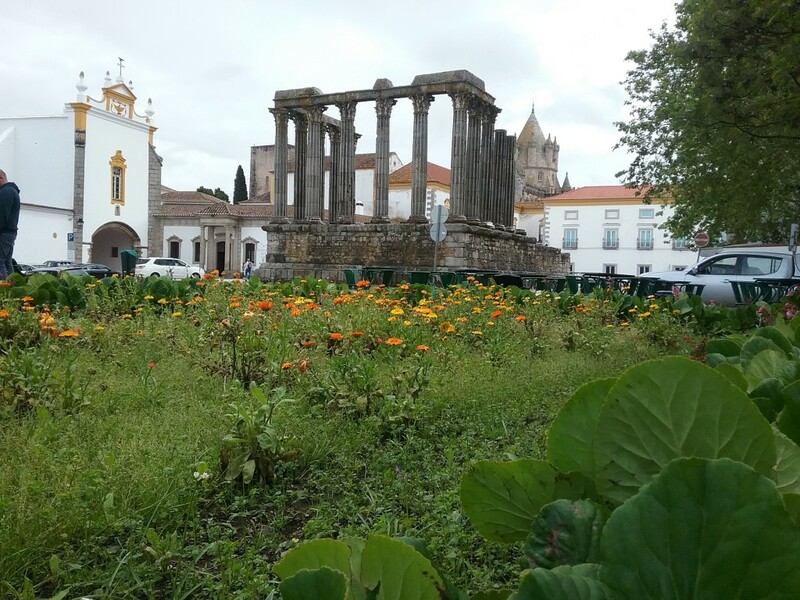 Then I drove to Evora and tromped around the old parts of town with a primary goal of being able to see the temple of Diana, a Roman ruin at the highest point of the old city. It was as impressive as I remembered. I decided to head back to my car from the temple and chose to take a slightly different route. Now if you’ve ever been in an old European city you understand that the streets are not grid like. I ended up exiting the old city left of where I expected to be and turned left to get back to my car. I happened to completely miss my vehicle and ended up back on the opposite side of the old city. Now I was running short on time to get to the hotel to see Tom finish and I was in a bit of a panic. I had to run back up the hill and through the center of the city, past the temple again and head back out of town via my original path. As this was happening the skies opened up and I got completely soaked. I made it to the hotel just in time for Tom’s finish but somehow I missed him anyway. The routine has been that I have used my 30 to 60 minutes of spare time before beginning massage to help Tom with his cleaning, either his bike or his clothing. This time it was his clothing and I can honestly say that I don’t think I’ve seen bathtub water dirtier. 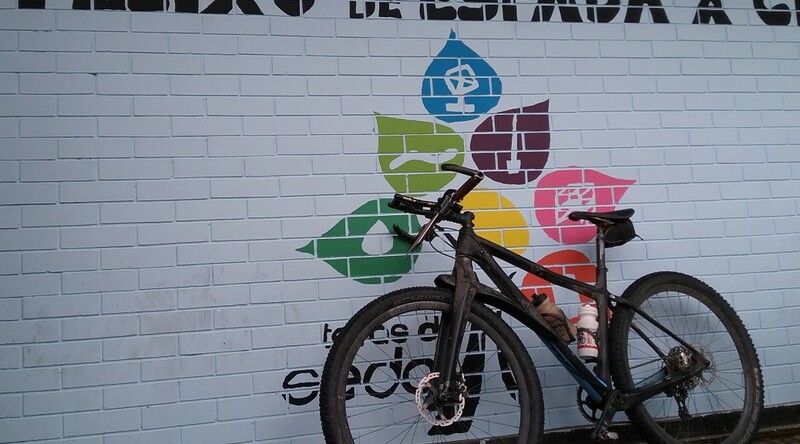 Everything about this race is so much harder with the wet and the mud, washing clothing and bikes takes so much longer not to mention all the maintenance that has to happen. Tom does his bike maintenance while I’m doing massage. There’s just no time for rest during the day. I’m exhausted and I’m not even the one riding. I fell sound asleep after dinner while Tom was at the rider briefing, so much so that he couldn’t wake me knocking on the door and had to get a new key to get in. Then he had to help me get undressed and into bed. If that’s not a great partnership, I don’t know what is. 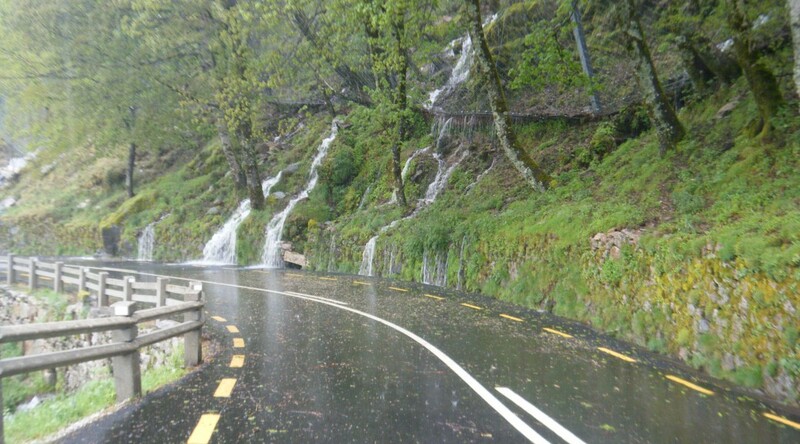 It rained long and hard most of the day yesterday, there was even hail. This morning the temperature was near freezing, still raining, high winds and fog that dramatically limited visibility. Just before the stage started and yes I’m wearing all of the clothes that I brought. 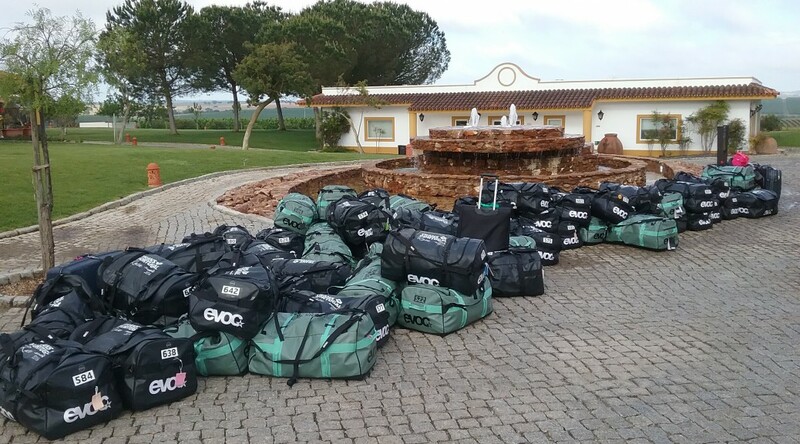 The large number of riders that did not start the stage complicates race logistics greatly. Now the race organization has to find a way to move those people and their bikes to the next location. So I helped today by driving a staff member to her check point and assisting for most of the checkpoint. It was warmer down in the valley but still only 13° C, (58°F) and raining. Hypothermia for the riders was still a big concern. I was very excited to see Tom early in 15th position with 80 km to go. Tom managed his effort level and nutrition beautifully throughout the day and even had some nice relaxed points during the race where he managed to take some photos. Tom getting some encouragement from the suser fast fasties. By the end of the stage Tom had gained another four places to finish in 12th. Total time on the bike was about eight and a half hours. A very long wet day. This photo is actually from day too but it gives you a good idea of how things look out there. Tomorrow’s stage promises more of the same weather, the terrain may be a little bit faster but it’s still a very long day at approximately 160 kms. 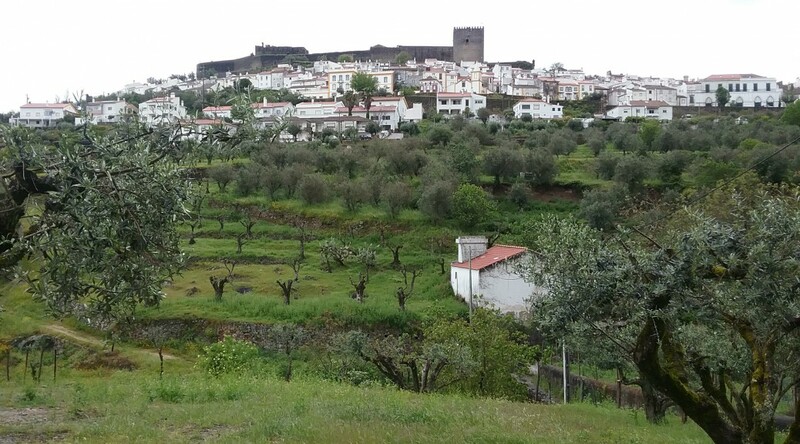 That will give me lots of time to explore the beautiful village of Castelo de Vida, with its castle that was constructed in the 1300’s. Perhaps I will visit the near by prehistoric ruins. Then I’ll head to Evora where there are many more ancient ruins and even Roman structures. 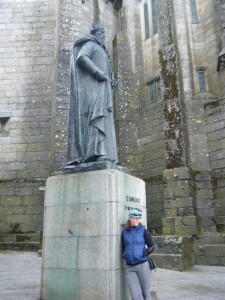 TransPortugal – Day 3, the unexpected rest day. As mentioned in my last post, today’s stage had been cancelled due to extreme weather conditions. So instead of writing an article about the day’s events I’m going to treat you to a bunch of pictures instead. 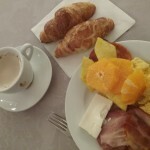 Let’s start with Portuguese breakfast! Then off to Tom’s happy place when not on the bike, the mechanic’s area. Errands and a quick trip in the old part of town. Well, that didn’t turn out quite the way anyone expected. We were all lulled into a false sense of security by the pleasant conditions at the start. 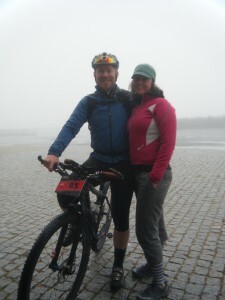 The mud was expected but not the single digit temperature (remember, this is celcius) with pouring rain and wind. Many athletes did not finish, perhaps as many as 35. Many more came in hypoglycemic and dangerously cold. There were several crashes, likely due to the combination of wet conditions with loss of coordination from hypothermia and low blood sugar. Even Tom who usually thrives in these conditions was pale, shivering and very bonky at the end. But he responded quickly to some food, warm water and a change of clothes. His provisional placing on today’s stage was 23rd. I hoped to spend my day walking around the historical villages on the way to Guarda, but the weather was even too cold and miserable for that. In fact, I didn’t even take any photos. 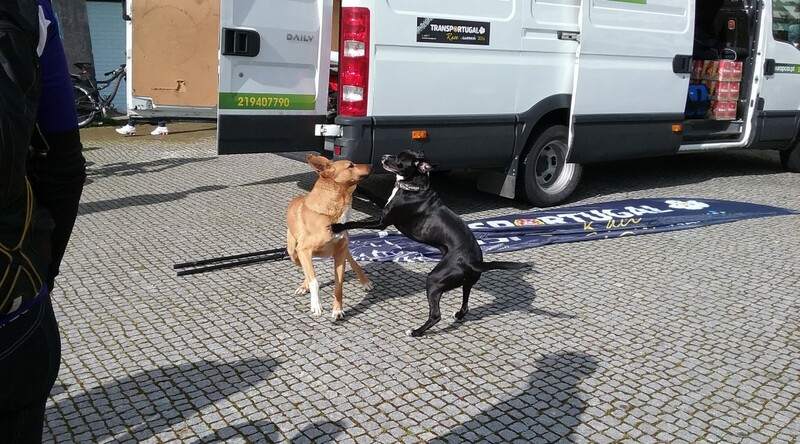 The featured photo above is Rocky (black), the TransPortugal staff support dog playing with a stray in the village square. 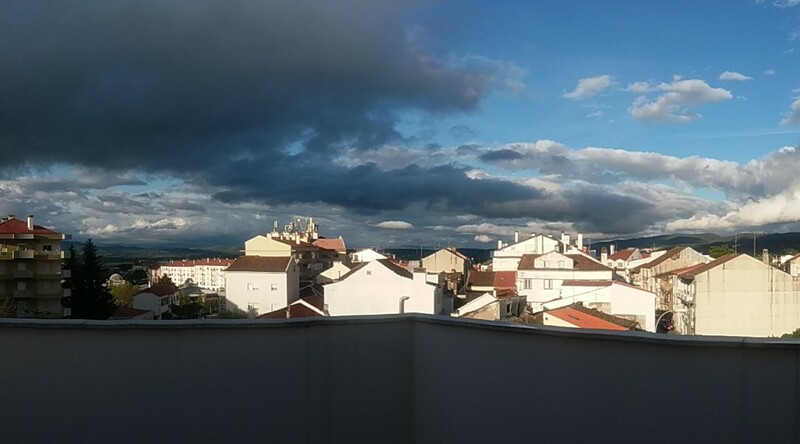 I took that this morning when the mood was light. Before everything went pear shaped. And now we have been informed that the stage tomorrow is cancelled. The weather is supposed to be very cold. 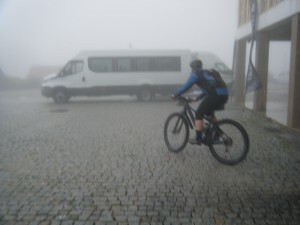 Stage 3 is the big climbing stage that goes up to almost the highest point in Portugal. They are calling for 0° and rain, maybe even snow. Canceling the stage is the right choice in terms of safety for most of the riders, but Tom is disappointed. A cold and hard climbing day plays to his strengths, a recovery day for the ride does not, in fact it works against him. One of Tom’s physiological anomalies is his ability to recover quickly. More recovery time in the middle of the race takes away from that advantage as the other riders can catch up on their rest. But the day off tomorrow will provide some much needed bike maintenance time. Cables are dragging, brakes need work, lots of moving bits need a good cleaning and lube. 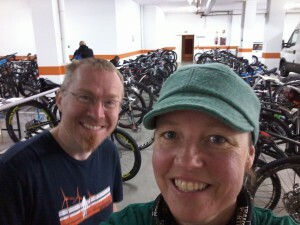 Tomorrow’s adventure will be finding a bike shop and functioning in Portuguese! The end of stage of day one is a logistical nightmare. 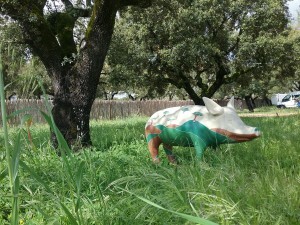 We are in very rural Portugal close to the Spanish border in the largest village for 50km but it’s still quite small. There is no single hotel to house all the athletes so the organization uses multiple hotels with shuttle buses as needed to and from the finish line. Combine that with riders coming in approximately 1 hour or more later than expected, motorcycles getting stuck in the mud and a vehicle breakdown preventing staff from getting to the finish line and it’s no wonder the race staff are under extreme stress. 17:30 – Currently I am sitting at the finish line watching the first riders come in. The first massage was supposed to begin approximately 60 minutes ago but the riders are much slower than expected because of the wet conditions. Originally, I had agreed to work for 2 hours per day. I will work later tonight to help out as much as possible. It will be a late night for everyone, especially the mechanics. The bikes are coming in covered in mud and almost unrecognizable. 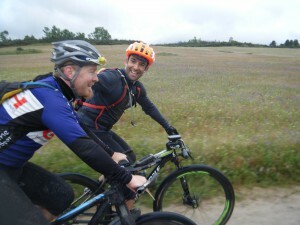 In other years at this race, the front runners usually get off the bikes looking like they could ride another 50km. Not this year, most of them look haggard. 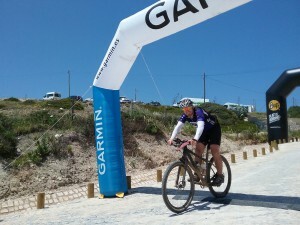 17:50 – Tom rolls into the finish line in approximately 31st place. Everything is absolutely coated in gritty mud. He is tired but good. 9 hours on the bike. 21:00 – My last massage of the night is finished, riders are still coming in in the dark. 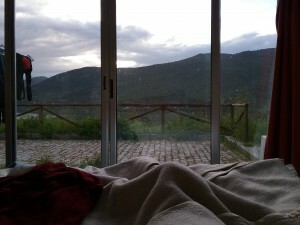 Tom and I awoke to a beautiful view of the Douro and surrounding hills. Given all of the challenges of the day, the race organization did an excellent job managing the situation. The mechanics were up most of the night dealing with all the problems that come with riding your bike through gritty mud for 8 plus hours. The formal massage team finished at approximately midnight. Today should not be as wet and cold. But the ground is still soaked and flooded in places. It’s going to be another long day for both staff and racers. The mood at the start line for today’s stage is much lighter having made it through the most stressful day. The spirit of the race will really start to shine through over the next few days. 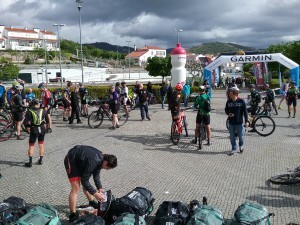 Tom Letsinger and I arrived in Braganca May 7, for the Garmin TransPortugal 8 day mountain bike race. I was so happy to see some of my old Portuguese friends when I arrived at the hotel. 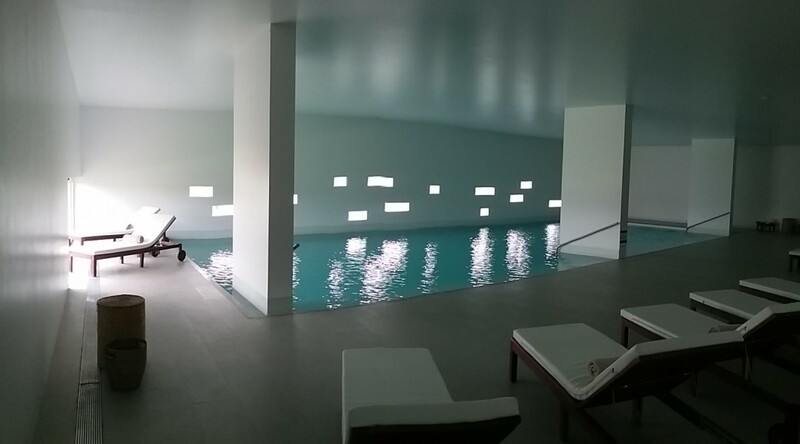 Portugal is really starting to feel like a home away from home. This is the first year I have come to the race and I have not been a full staff member or a racer. I am not very good at standing on the sidelines but I’ve also desperately needed a vacation, so I arranged with the organization to do body work in the evening for approximately two hours to help out the massage staff. It’s a perfect balance of being on my own during the day and having some good downtime but still feeling like I’m part of the race. Day 0 is always very chaotic with riders anxious, staff very busy and a tight schedule. This year should turn out to be quite interesting as the weather has been cool and rainy. 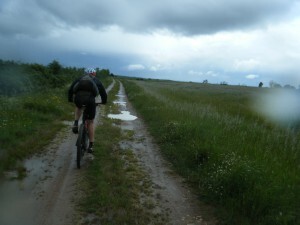 There will be a lot of mud and both the bikes and riders will suffer. 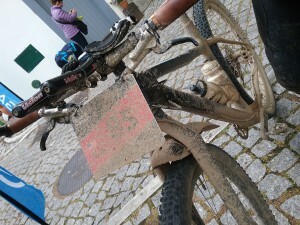 I’m anticipating a lot of mechanical difficulties due to the conditions and a lot of saddle sores from the wet and grit. Here’s a link to my advice on saddle sores from my race experience in 2013. Tom doing final bike prep. Tom always says that day 0 is the hardest day. That’s when all the stress happens. After that, you’really just out for a bike ride, albeit a very long one. Good luck to all the racers and staff!